Boxing is a combat sport in which two people engage in a contest of strength, speed, reflexes, endurance, and will, by throwing punches at each other, usually with gloved hands. 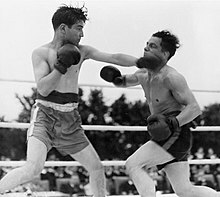 Traditionally, the goal has been to knock the opponent unconscious from blows to the head. One can also win by technical knockout or on points. You know, I cut easily, so I don’t think I would’ve won the title, but I would’ve been a contender. Compared with football, boxing is gentle as the ancient pastoral pastime of tending sheep. A ten-second knockout, to the football man, is a joke; he'll get knocked out thus fifteen times every game. The rules of his sport give him three minutes to wake up—or the time which spells the boxer's finish multiplied eighteenfold. He is trained and exalted to a point of Spartan fortitude which is at once the wonder and disgust of the pugilist. He will continue to play with a sprained ankle, with a twisted knee, with a shoulder out of joint. He never leaves the arena of his own volition; he has to be dragged out—usually held by main force flat upon a door. In his world exist no towel or sponges. I am close to believing the Carpentier-Dempsey match the most beautiful thing I ever saw. And here we have the imitation close to the original, close to its meaning, near enough to be a symbol. No clutter of useless details; the thing itself, clean and sharp. A boxing match, to some of the other games, is like a Greek statue to a Doré print, a Greek play to some turgid Victorian three-decker. James Hopper, as quoted in "Sports and Athletics: The Most Beautiful Sport"
Comment: Regarding his reference to "the imitation [being] close to the original," Hopper's premise, as regards both boxing and football, is that "any game, or sport, is an imitation, and the refinement, on some original human activity," the respective prototypes being, in this instance, a duel to the death and war itself. Boxing Day. I hope it will be made clear on this foggy anniversary of it to every foreigner who is passing his first Christmas in London, and who may have read that la boxe has been put down in this country, that the shops are not closed and a holiday given to those employed therein to enable them to spend Boxing Day in fist-fighting, an old English sport and pastime not now kept up, except under the influence of an excess of liquor, Pugilism being mainly restricted to conflicts on the question of who was the architect of the Houses of Parliament. This page was last edited on 9 January 2019, at 18:53.